It violates the essence of what made America a great country in its political system. Now it’s just an oligarchy with unlimited political bribery being the essence of getting the nominations for President or being elected President. And the same thing applies to governors, and U.S. Senators and congress members. So, now we’ve just seen a subversion of our political system as a payoff to major contributors, who want and expect, and sometimes get, favors for themselves after the election is over. … At the present time the incumbents, Democrats and Republicans, look upon this unlimited money as a great benefit to themselves. Somebody that is already in Congress has a great deal more to sell. So: was this former President’s provocative allegation merely his opinion? Or was it actually lots more than that? It was lots more than that. Only a single empirical study has actually been done in the social sciences regarding whether the historical record shows that the United States has been, during the survey’s period, which in that case was between 1981 and 2002, a democracy (a nation whose leaders represent the public-at-large), or instead an aristocracy (or ‘oligarchy’) — a nation in which only the desires of the richest citizens end up being reflected in governmental actions. This study was titled “Testing Theories of American Politics,” and it was published by Martin Gilens and Benjamin I. Page in the journal Perspectives on Politics, issued by the American Political Science Association in September 2014. I had summarized it earlier, on 14 April 2014, while the article was still awaiting its publication. I then quoted the authors’ own summary: “The preferences of the average American appear to have only a minuscule, near-zero, statistically non-significant impact upon public policy.” The scientific study closed by saying: “In the United States, our findings indicate, the majority does not rule—at least not in the causal sense of actually determining policy outcomes.” A few other tolerably clear sentences managed to make their ways into this well-researched, but, sadly, atrociously written, paper, such as: “The preferences of economic elites (as measured by our proxy, the preferences of ‘affluent’ citizens) have far more independent impact upon policy change than the preferences of average citizens do.” In other words, they found: The rich rule the U.S.
Basically, the Buckley decision, and subsequent (increasingly partisan Republican) Supreme Court decisions, have allowed aristocrats to buy and control politicians. Already, the major ‘news’ media were owned and controlled by the aristocracy, and ‘freedom of the press’ was really just freedom of aristocrats to control the ‘news’ — to frame public issues in the ways the owners want. The media managers who are appointed by those owners select, in turn, the editors who, in their turn, hire only reporters who produce the propaganda that’s within the acceptable range for the owners, to be ‘the news’ as the public comes to know it. 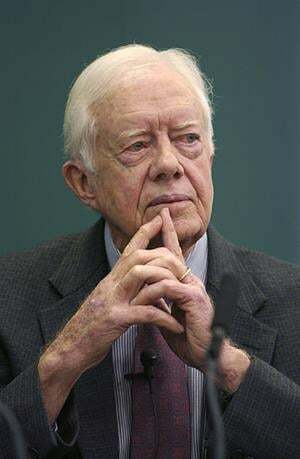 Carter — who had entered office in 1976, at the very start of that entire era of transition into an aristocratically controlled United States (and he left office in 1981, just as the study-period was starting) — expressed his opinion that, in the wake now of the two most extreme pro-aristocratic U.S. Supreme Court decisions ever (which are Citizens United in 2010, and McCutcheon in 2014), American democracy is really only past tense, not present tense at all — no longer a reality. A New York Times analysis of Federal Election Commission reports and Internal Revenue Service records shows that the fund-raising arms race has made most of the presidential hopefuls deeply dependent on a small pool of the richest Americans. The concentration of donors is greatest on the Republican side, according to the Times analysis, where consultants and lawyers have pushed more aggressively to exploit the looser fund-raising rules that have fueled the rise of super PACs. Just 130 or so families and their businesses provided more than half the money raised through June by Republican candidates and their super PACs. Investigative historian Eric Zuesse is the author, most recently, of They’re Not Even Close: The Democratic vs. Republican Economic Records, 1910-2010,and of CHRIST’S VENTRILOQUISTS: The Event that Created Christianity.